I'm not as keen on flax seeds as most raw foodists. I guess it's because I'm an artist and grew up with linseed oil as a paint thinner, not something to eat! The small amounts of Prussic acid in flax will not harm you; you'd have to eat pounds of it to get the toxic amounts. People eat flax to thin the blood because it is high in Omega 3 fatty acids. This is a new buzz word, but the point of Omega fatty acids is to balance them, not to just run out and eat a ton of flax oil. Walnuts, also lauded as high in Omega 3 are also high in Omega 6. Omega 6 is necessary to the functioning of the body, but on the standard American diet people eat muscle meat from animals raised on grains (not grass) and eat too many grain products, so they get a ratio of 100-1 Omega 6 to Omega 3 instead of the recommended ratio of 3 or 2-1. A good rule is to stay under 6-1, which is very difficult if you eat a lot of grains and oils like canola and corn. Most nuts are very high in Omega 6s. Unlike many land animals, humans need the same ratio of Omegas that sea animals need. You can get Omega 3s from sea products EXCEPT farm bred salmon, and from grass fed animals IF you eat the organ meat. The other way you can get Omega 3s is from many greens such as spinach, kale and the entire mint family. Which brings us to Chia seed, made famous by the hokey commercial where kids used the seeds to grow in ceramic figures for instant "hair." Chia is the seed of a member of the mint family: one of the sages, closely related to common garden sage. Go ahead and eat all the seeds of this family, unless the plant is not familiar to you. There is nothing wrong with peppermint seeds, except that they are TINY. Chia seeds are large for seeds in the mint family. But the cool thing about chia is that when you add water to them, they swell and get very sticky, not so much slimy as like a pudding. I use this quality of chia to make desserts. For this pudding, I took a half-cup of chia and added about the same amount of water. Stir the seeds and let them soak. Then you have a pudding base to which you can add just about anything. 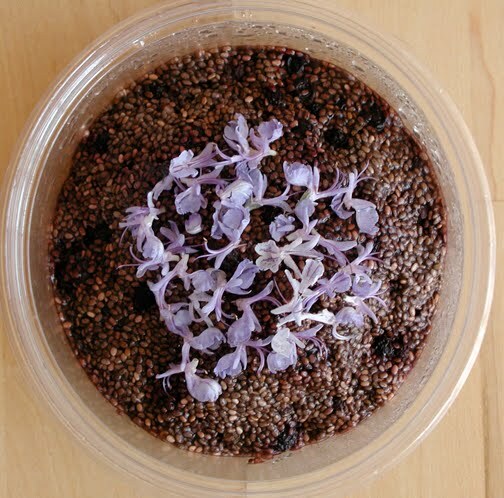 Sweet, dessert type stuff is more familiar to us; if you were to add salt, the chia would be more like caviar. Here is a recipe for a pudding to nourish the crown chakra at the top of the head. Blue-indigo is the color of this chakra. Good for the sinuses and the eyes! I love edible flowers. They are often very tasty and they put pleasure into food preparation. 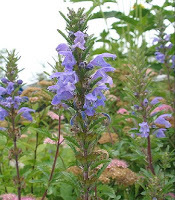 I'm taking you on a tour of blue flowers in this post by family. My favorite blue flower is Anchusa azarea, a plant in the borage family common to the Mediterranean. This is a tough plant and wonderful to grow. Unlike comfrey, it does not spread everywhere. 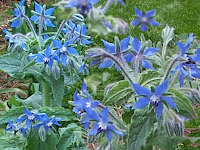 Unlike borage, it is a perennial. It produces hundreds of beautiful blue flowers in late May and again in late summer if you cut it back. But the secret is: if you get to the flowers before the bees do, they are absolutely delicious. If the bees get there first, they are pretty, but not sweet, very mild. 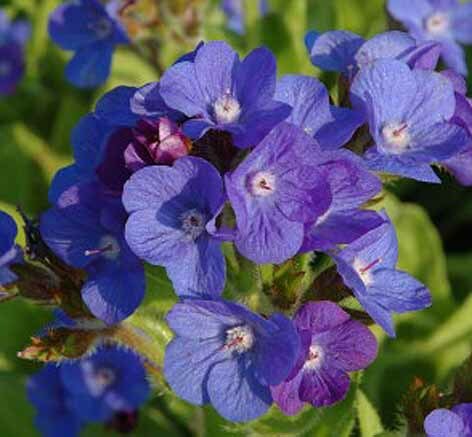 But I love blue in the garden and anchusa is spectacular. The flowers go well on salads and on deserts or are fun to eat out of hand. The plants are carefree, but might want to be tied back because the stems are so heavy with flowers that they tend to fall over! A flower for the back of the garden, the same size as glads. 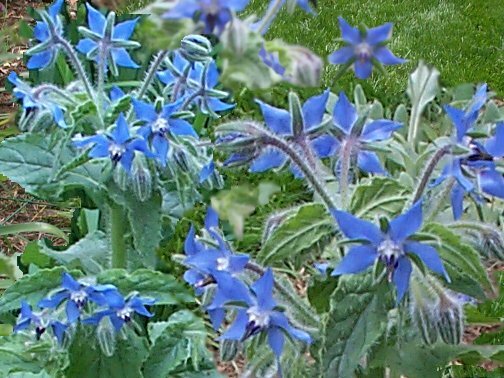 The famous flower in the borage family is...borage! These little gems are also very sweet, but the bees love them. This is a re-seeding annual, another carefree plant that will keep coming back even in very cold climates. The seeds are used to make borage oil and the leaves have a pleasant taste of mild cucumbers. The flowers are beautiful and have been used for ages in sweets and candied for drinks. There is also a beautiful blue comfrey in this family if you like comfrey. The flowers of lungwort are also a gorgeous blue color. 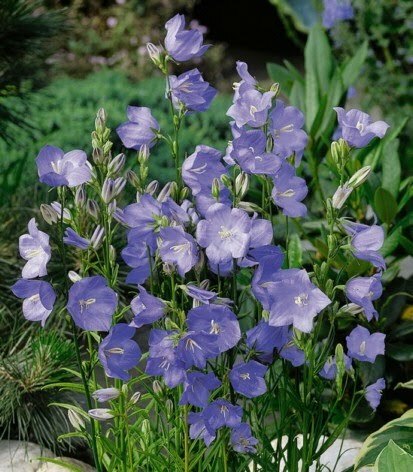 I keep going on about the campanulas, which used to be called "rapunsel" in Europe and are also called "rampions" and "harebells." All of the campanula flowers are edible and very benign. There are campanulas that spread like wildflower and there are some that are better behaved. Some are arctic flowers and will do well at zone 2, if you are blessed with that climate. They are tough plants and the bees love them. They have been selected and bred widely and there are rock plants and tall plants and drought friendly varieties. Although some campanulas are good for roots and others for leaves, all have wonderful flowers. Grow some just for the fun of throwing the flowers on a salad all summer. The onion family is blessed with a number of beautiful blue flowers. However, some taste like onions! The flowers of grape hyacinth are HOT, like strong garlic or onions. So most of these are not desert flowers. You have to taste them to see. Most of the onion family has white flowers, some light pink. But some of our favorite flowers of all time are in this family: tulips, lilies, and gladiolas. 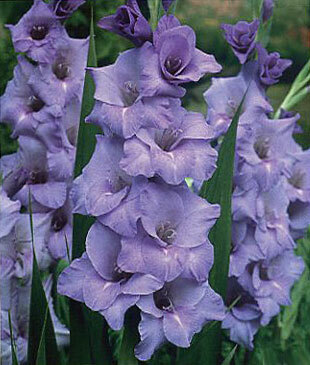 Gladiolas are wonderful flowers in mid-summer for sandwiches, salads and anything else you can think up. They are strong enough to hold up well, but not to cooking where they will turn into a little slimy mess. They are mild and taste like not much at all, but they have a texture like a baby lettuce. 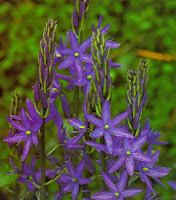 There are many other flowers in the onion family that are worth trying because they are so easy to grow. One of the most beautiful plants in this family that is still wild is the camass, not to be confused with the "death camass" which has white flowers. Some are native to the Rocky Mountain West, which gives you a clue as to their hardiness. I include them here as an example of a beautiful plant to grow in a "wild" garden that will give you a little bit of "blue" to throw on your salad. I love nigellas. There are three basic nigellas. The Spanish nigella has rather hot seeds, and the Nigella sativa has seeds that are almost the same as onion seeds, and called that by Indians. The seeds are widely used in Indian and Mid-Eastern and Slavic cooking. 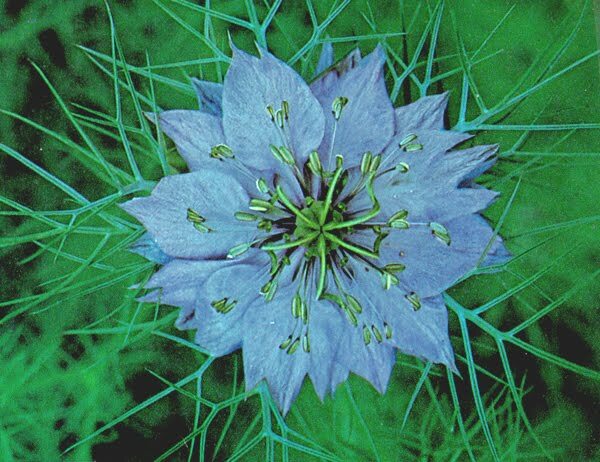 But the garden variety nigella, called "damascena" or commonly, "love-in-a-mist" has sweet seeds that are used in confections. The flowers are stunning, some of them pure blue. The ripe seed heads are used in dried arrangements. This is another self-seeding annual that will come back year after year. 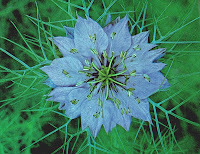 If you like Indian cooking, do not go without planting "black seed" or Nigella sativa in your garden for a spicy treat. And violas, pansies and violets! Where would edible flower cooking be without them? I've had pansies and violas last all winter in my Colorado gardens. They are hardy, pop back after hard freezes and snowstorms and will be a staple of your winter garden in milder areas. And the color! 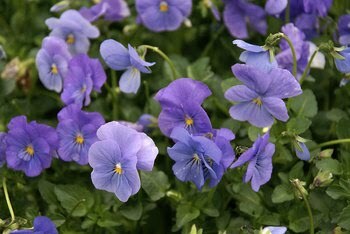 Flowers in the viola family have been bred into every color imaginable. When I did catering, I used these flowers as the backbone of my cooking when I did weddings to match the bride's colors. Easy to grow, pest-free, the foliage is edible, the flowers are edible and they are wonderful for gout, arthritis and a host of over blood and joint problems, having salicylic acid. The other family where you find a number of edible blue flowers is in the mind family. This is a picture (courtesy of the web--thanks!) of dragon's head, which is a citrus tasting tea plant that comes in a re-seeding annual or a perennial and is native to Eastern Europe. The leaves and flowers are delicious in teas or in salads and deserts. 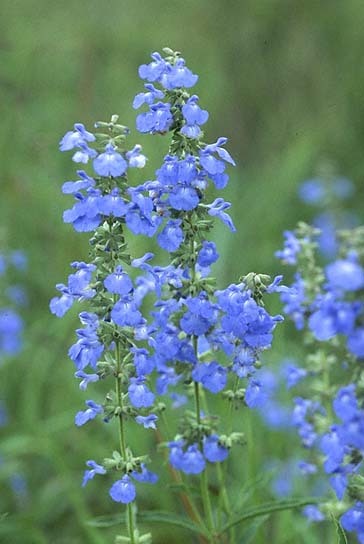 Many of the members of the sage family have blue flowers and are very good. But some tend to be a bit strong, so taste first. Where I live, rosemary blooms in March, so I have used those flowers in my pudding. The flowers taste like mild rosemary and made a suprisingly good combination with the elder and blueberries. Use the flowers of lavender and mints, thyme and hyssop on all of your creations. Cooking with flowers adds elegance and pizazz to your meals. Children love edible flowers. They also love bright colors. The next time you go out in the garden, pick some flowers. Most garden plants have edible flowers, with the exception of the tomato family, which are controversial. Sounds tasty. Do you know about these chakra books? With regards to Anchusa azarea mine is incredibly invasive! I have to pull it up again and again...and any piece of the root will grow...I have to pull the leaves every week...I keep it in certain areas...near the fence...not near the other flowers as it grows so fast....It is beautiful...but you sometimes forget when they are so prolific!!! Hi, sorry to ask... Nigella damascena... can you also eat flowers and leaves? in salad, or dried in tea herb mix?